We all know that blowouts should last at least 2 or 3 days. But sometimes they can last 4, 5, sometimes up to 6 days. Not everyone’s hair can achieve such longevity, but below you’ll find some great tips on how to make the most out of that blowout appointment. This is the day you get your blowout. Make sure your stylist doesn’t use more than 2 products in your hair. Using too many styling products can cause build up which prevents perfect styling and allows your hair to get dirtier faster. A silk pillow case will reduce friction which will cut down on frizzing up while you sleep. I also love show all of my clients how to pin their hair up at night. 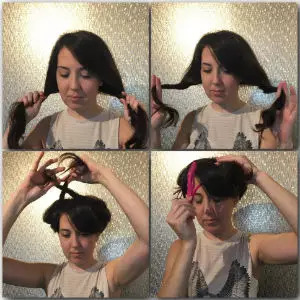 Split your hair into two sections. Twist away from your face. Cross the two section on top of your head. The hair sits, gently curled, on top of your head and you barely notice it’s there. You should still be in pretty good shape on the morning of day 2. If needed, add a re-styling spray or dry conditioning spray just to your ends to freshen them up. Use a round brush and hair dryer to smooth out any pieces that may have gone rouge over night. By now your blowout may be falling a little flat. Use a round brush and a hair dryer, or some velcro rollers to add some volume back to your roots. This shouldn’t take more than a few minutes. We’ve made it! We’re well into extended blowout territory. Time to bust out the dry shampoo. Spray dry shampoo just on your roots and massage your scalp with your fingers to rub it in. Repeat this at night to help absorb any oils that may be produced while you sleep. For more, check out “How To Use Dry Shampoo Correctly“. By now you hair may appear to have a mind of it’s own; lean into it. Add some curl with a curling iron or wand to give it some wave/curl. Use a texture spray to add some hold and sass. By day 6, we might be getting to the point where it’s no longer presentable to wear your hair down. It’s still holding its shape, but it’s falling flat and looking lackluster. This is a good time to remember that top knots aren’t just for ballerinas. Try a cute, stylish bun; or a fun ponytail. Time for a good shampooing. Wash, rinse, repeat. Shampoo your scalp twice to get it nice and clean and ready for the next week. Or, come on in and let us do it for you! Give these steps and try and see how long you can make your blowout last. Every day should be a perfect hair day!